Offload memory cards in the field with up to 3TB of portable, wireless storage with the My Passport Wireless Pro from WD. With a built-in card reader, you can easily back up photos and videos from SD memory cards, coming from digital cameras, GoPros, and other recording devices, to the My Passport Wireless Pro without the need for a computer. WD has armed the My Passport Wireless Pro with an 802.11ac Wi-Fi module along with a hard drive so you can access and share up to 3TB of content wirelessly with tablets, computers, digital cameras, and other wireless devices. The My Passport Wireless Pro lets you stream up to 8 HD videos simultaneously and is formatted in exFAT, delivering compatibility with Windows, Mac, and other systems. Moreover, you can set up the My Passport Wireless Pro as a hotspot to share Internet connectivity with other devices. Aside from wireless connectivity, the My Passport Wireless Pro comes equipped with an internal 6400 mAh battery, which provides it with all-day power (up to 10 hours), and a USB 2.0 port for recharging mobile devices. The USB 2.0 port can also be used to transfer data from thumb-sized USB drives and other external USB storage drives to the My Passport Wireless Pro. In addition, a USB 3.0 connection is available to recharge its internal battery as well as quickly transfer multimedia content to a computer system without Wi-Fi abilities. Built with 802.11ac technology, the My Passport Wireless Pro is able to deliver fast data transfers and smooth HD media streaming capabilities. Wirelessly transfer images you capture in the field via FTP Mode with your compatible DSLR camera to the drive, where the content can be backed up, viewed, and edited using a connected tablet or laptop. 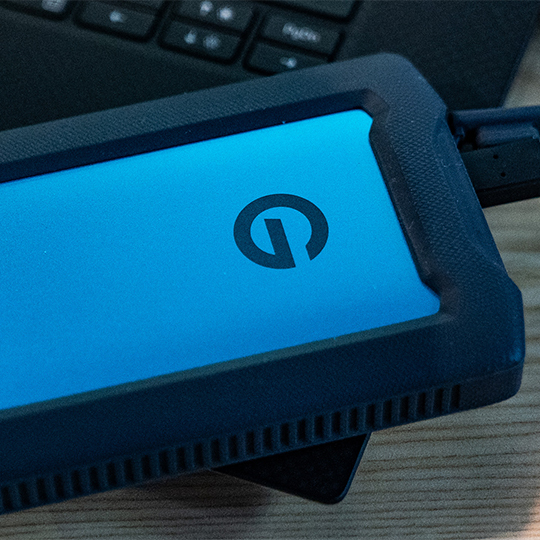 The integrated SD 3.0 card reader delivers fast media transfers while you're out of the office. You can move or copy high-resolution photos and Full HD videos from your camera's SD card to this high-capacity drive. Take the My Passport on a long trip to continuously stream videos while on the road. It lasts up to 10 hours while streaming a 720p, 3 Mb/s video to one device over Wi-Fi 2.4 GHz. Actual battery life depends on file size, type, format, bitrate, devices connected, Wi-Fi connectivity, settings, and other factors. You can charge your smartphone, tablet, and other USB devices on the go via an integrated USB 2.0 port on the 6400 mAh power bank. The two built-in USB ports quickly transfer a large amount of RAW images or Full-HD vides to or from your computer. Plex organizes your entire media collection with one simple interface and visually enhances it by adding descriptions, plot summaries, posters, and album covers. 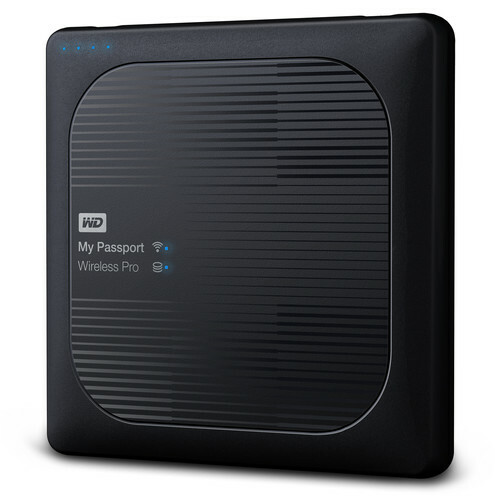 Wirelessly stream media stored on your My Passport Wireless Pro to all your devices, including your PC and Mac computers, smartphones, tablets, Smart TVs, and more. Wirelessly connect the My Passport Wireless Pro to your mobile devices using the My Cloud mobile app so you can view, organize, edit, and share your media files from anywhere with your tablet and smartphone. Adobe Creative Cloud equips you with the tools you need to turn your ideas into creative masterpieces. Since My Passport Wireless Pro is Creative Cloud connected through the My Cloud mobile app, you can quickly get your photos and videos from your camera to your drive and into the Creative Cloud ecosystem. With just a few clicks on your tablet, you can open, edit, and save files wherever you are. When you connect an optional external USB storage device to your My Passport Wireless Pro, you'll be able to wirelessly access content on that external device using your computer, tablet, and smartphone using the My Cloud app. It becomes a network share on your My Passport Wireless Pro, so you have access to your data. The My Passport is formatted in exFAT, which eliminates the need to reformat the drive. Wi-Fi password protection helps keep your photography, videography, music, and important files safe from unauthorized wireless access. Set up Drive Lock in the device dashboard to prevent USB access to your content in the unlikely event it is lost or stolen. Use the My Passport Wireless Pro as a Wi-Fi hub to share an Internet connection with up to eight devices. Connect multiple devices to your My Passport Wireless Pro and simultaneously stream up to 8 HD videos (3 Mb/s HD MP4 streams). My Passport Wireless Pro is equipped with two different wireless bands: 5 GHz 802.11ac band for faster performance on compatible wireless AC devices and 2.4 GHz 802.11n band for better long-range performance for wireless AC and N devices. Box Dimensions (LxWxH) 7.8 x 6.1 x 2.2"
3TB My Passport Wireless Pro USB 3.0 External Hard Drive is rated 4.1 out of 5 by 36. Rated 5 out of 5 by Svandive from Everything I wanted It to be. I have a been along time user of the Seagate Wireless Plus, but this solution has not been maintained well by Seagate and as such is quite far behind software wise. Additionally the hardware was under powered when it first came out and of course that stands true today. The WD Wireless Pro is what I had always hoped from a wireless hard drive. Fast, efficient, portable and useable. I can run multiple streams from he onboard Plex server, store seemly endless numbers of RAW photos form my Canon 80D, and work on projects that are just too big to be hauling around with me on my MacBook Pro. All while I'm sitting on a plane!! I love this drive. Rated 5 out of 5 by Silver Back from GREAT product - Important information I'm a professional photographer and this unit has improved my on-the-road workflow. I use it to create a WiFi network that allows a graphic designer and an editor to access what I've shot minutes after loading the images onto the drive. It also will automatically ingest (move or copy) files from an SD card or USB drive plugged into its onboard ports. NOTE: This is NOT a low-tech solutions for users who are hand-held through the use of computers or other modern technology devices. If you're not savvy enough or don't have access to some who is - you'll probably be quite frustrated. But then, that is one of the things that separates thedilettante from the professional! Rated 5 out of 5 by Jean Jacques from Great item when your on the field I had been looking for this item for a long time. There is also the SSD version which is 3 times more expensive. This version suits me very well. It is so much practical when your card is full and need to download your files. No need for a computer. You insert your card in the enclosed SD card reader, press a button for a few seconds and your card is replicated on the hard drive. You can later copy the files on your computer for editing. This is particularly great when you shoot videos and have to download or duplicate your files as backups. Just at the touch of a button. The phone app affiliated to the HD allows you to view and stream your files from your phone. Rated 4 out of 5 by Kent from Nice External hard drive A External Hard Drive like this one is what I've been wanting for a long time. I always wanted to get a mobile storage device that I could put my Memory Cards in and back up my camera images when I'm on vacation. This filled the bill. The only thing I don't like about the drive is its not easy to get connected to your devices. Maybe because the instructions aren't easy enough or because I'm not a super tech user, I found it difficult to get my devices connected. After what seemed like a long time, I finally figured out how to connect my phone and tablet to it thru WiFi, and it was easy getting my notebook and desktop connected by cable, but I still haven't figured out if it's possible to connect my computers through WiFi. The drive seems very fast connecting through a USB3 connection, taking what seemed like a short time to back up over 100 GB of images. I admit, I haven't tried wireless transfer or Memory Card transfer yet. So far, except for the difficulty in making wireless connections, I really like this drive. Rated 4 out of 5 by Derek the Good from need this in the field... the manual came inside the drive itself and good thing too because the quick setup guide didn't go into detail. it basically tells you to download the app and setup the drive through the mobile app. i did that and it didn't work at all. it wouldn't copy the files from the sd card. so i reset the drive and setup again this time through computer and browser. finally, it worked and has been working fine since. copy times are pretty fast and the indicators are the blue led lights. when all 4 are lit your content has been copied over. it does say in the manual in order to view content through the mobile app the content must be synced to the drive...i'm guessing that means set it all up the first time by way of computer and browser but i could be wrong. it seems better to do it that way anyway as the dashboard makes it clearer and easier to see and change all options to your liking. i'd give it 5 stars if it came with the case for transport. but i got a cheap neoprene case at the dollar store...problem solved. i'm using this in the field with the ipad and haven't had any problems so far viewing and transferring files from the drive through wi-fi. this helps a lot.